Anthony "Tony" La Russa, Jr. (/ləˈruːsə/; born October 4, 1944) is an American professional baseball player, manager, and executive currently serving as chief baseball analyst and advisor for the Arizona Diamondbacks. He is best known for his tenures as manager of the Chicago White Sox, Oakland Athletics, and St. Louis Cardinals of Major League Baseball (MLB). His MLB career has spanned from 1963 to the present. As a manager, La Russa guided his teams to three World Series titles, six league championships and twelve division titles in 33 seasons. His 2,728 wins as a manager ranks third all-time in major league history, behind Connie Mack and John McGraw. La Russa was named manager of the White Sox in the middle of the 1979 season and guided the White Sox to an American League West division title four seasons later. 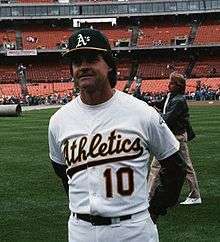 Despite being fired in the middle of the 1986 season, the Athletics hired him less than three weeks later, and La Russa led the A's to three consecutive American League championships from 1988 to 1990 and the 1989 World Series title. He left Oakland following the 1995 season to manage the Cardinals, and led the team to three National League championships and the 2006 and 2011 World Series titles. La Russa retired after winning the 2011 title and 33 seasons as a major league manager. Three months later, he accepted a position assisting fellow former manager, Joe Torre, the executive vice president for MLB operations. In 2014, he became the Chief Baseball Officer for the Arizona Diamondbacks. La Russa was signed by the Kansas City Athletics as a middle infielder prior to the start of the 1962 season. He came up to the A's the next season, making his debut on May 10, 1963. In the following off-season, he suffered a shoulder injury while playing softball with friends, and the shoulder continued to bother him during the remainder of his playing career. Over the next six seasons, La Russa spent most of his time in the minor leagues, making it to the now-Oakland A's roster in 1968 and 1969. He spent the entire 1970 season with the big club, and then late in 1971 the A's traded him to the Atlanta Braves. His final big league playing stop was with the Chicago Cubs, where he appeared as a pinch runner in one game, on April 6, 1973. He also spent time in the organizations of the Pittsburgh Pirates, Chicago White Sox, and St. Louis Cardinals. In 132 total games played (40 in the starting lineup) he went 35-for-176, a batting average of .199. His 23 walks pushed his on-base percentage to .200. He had 7 RBI and scored 15 runs. He made 63 appearances at second base, 18 at shortstop, and two at third base, fielding .960 in 249 total chances and participating in 34 double plays. He is one of a select number of major league managers in baseball history who have earned a law degree or passed a state bar exam; others include John Montgomery Ward (New York Giants, Brooklyn and Providence, late 1800s), Hughie Jennings (Detroit, 1907–20, New York Giants, 1924), Miller Huggins (St. Louis Cardinals and New York Yankees, 1913–29), Muddy Ruel (St. Louis Browns, 1947), Jack Hendricks (St. Louis Cardinals, 1918, Cincinnati, 1924–29), and Branch Rickey (St. Louis Browns, 1913–15, St. Louis Cardinals, 1919–25). La Russa is also commonly credited for the advent of the modern specialized bullpen. La Russa credits Loren Babe and Paul Richards of the White Sox organization for helping him to become a manager. The White Sox gave La Russa his first managerial opportunity in 1978 by naming him skipper of their Double-A affiliate, the Knoxville Sox of the Southern League. La Russa spent a half-season at Knoxville before being promoted to the White Sox coaching staff when owner Bill Veeck changed managers from Bob Lemon to Larry Doby. Doby was fired at the end of the season; Don Kessinger, former star shortstop of the crosstown Cubs, was named the White Sox' player-manager for 1979, and La Russa was named manager of the Triple-A Iowa Oaks of the American Association. The White Sox fired Kessinger with a 46–60 record two-thirds of the way through the 1979 season and replaced him with La Russa. The White Sox played .500 baseball for the rest of the 1979 campaign. He credits Paul Richards with first inspiring him to believe he could succeed as a major league manager. La Russa was named American League Manager of the Year in 1983, when his club won the AL West but fell to the Baltimore Orioles in the American League Championship Series. The White Sox fired La Russa after the club got off to a 26–38 start in 1986. He finished his White Sox career with a 522–510 regular season record and a 1–3 post–season record. La Russa had a break of less than three weeks before his old club, the Athletics, called him to take over as manager. He led the club to three consecutive World Series, from 1988 to 1990, sweeping an earthquake-delayed Series from the San Francisco Giants in 1989. In 1988 and 1990, La Russa's Athletics lost the World Series to the Los Angeles Dodgers and the Cincinnati Reds by wide margins, despite the fact that the A's were heavily favored on both occasions. He earned two additional Manager of the Year awards with the A's, in 1988 and 1992, again winning the Western Division in the latter year. After the 1995 season, in which the A's finished 67–77, the Haas family, with whom La Russa had a close personal relationship, sold the team after the death of patriarch Walter A. Haas, Jr. La Russa left to take over for Joe Torre at the helm of the St. Louis Cardinals. He finished his Athletics career with a 798–673 regular season record and a 19–13 post–season record. It was as a player with the A's that La Russa first met catcher Dave Duncan, who would join his coaching staff in Chicago in 1983. The two have worked together on every La Russa-managed team since, and he often credits Duncan as playing a key role in his success. La Russa led the Cardinals to the 2011 World Series, after defeating the Philadelphia Phillies in the NLDS (3-2), and then the Milwaukee Brewers in the NLCS (4-2). 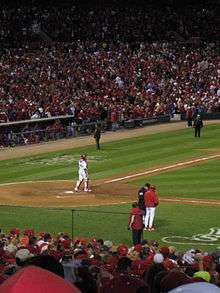 The Cardinals defeated the Texas Rangers in Game 7 of the World Series to win the franchise's 11th World Championship, and the third of LaRussa's managerial career. He passed Bobby Cox for 2nd place on the all-time post-season wins list with his 68th win in Game 3. Three days following the World Series win, La Russa announced his retirement, ranking second all-time in post-season wins with 70, third all-time with 2,728 regular season wins, second with 5,097 games managed, and second with 33 years (tied) managing with John McGraw. He finished his Cardinals career with a 1408–1182 regular season record and 50–42 post–season record. La Russa also became the first manager in Major League Baseball history to retire in the same season after winning a World Series title. Even though he had retired, La Russa managed the National League All Stars in the 2012 MLB All-Star Game for the final time in his managerial career. The National League won 8-0. After joining the Diamondbacks in 2014, La Russa was reunited with former assistants Duncan and McKay, and the general manager who hired him to manage the White Sox in 1979, Roland Hemond. On December 4, 2015, the Diamondbacks agreed to a six-year contract with free agent pitcher Zack Greinke worth a total of $206.5 million. At that time, it held the highest annual average value in MLB, exceeding $34.4 million per year, and was also the largest contract by total value in team history. One of La Russa's last moves as Cardinals manager: multiple defensive substitutions for the 9th inning, Game 7 of the 2011 World Series. La Russa ranks third in major league history in victories (2,728), trailing only Connie Mack (3,731) and John McGraw (2,763). He managed 5,097 games, joining Mack as the second manager or coach in American sports history to reach 5,000 games. In 2004, he became the sixth manager in history to win pennants with both American and National League teams; in 2006 he became the first manager ever to win multiple pennants in both leagues and the second manager to win the World Series in both leagues. La Russa has also joined Mack as the second manager to win World Series titles in three decades and to win pennants in four. He is one of only four managers to be named Manager of the Year in both of baseball's major leagues. His 2,000th game managing the Cardinals came on May 31, 2008. 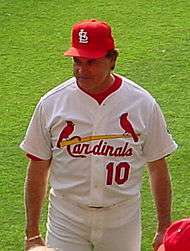 La Russa became the leader in wins by Cardinals' managers on August 31, 2007, when the Cardinals defeated the Cincinnati Reds 8–5, passing Red Schoendienst (1,041–955) to take the title. He managed his 2,500th win against the Royals at Kansas City on June 21, 2009 in baseball|2009]], becoming only the third manager to attain that win level after Mack and McGraw. La Russa and second wife, Elaine, are the founders of Tony La Russa's Animal Rescue Foundation, headquartered in Walnut Creek, California, which saves abandoned and injured animals as well as running programs to bring dogs and cats to abused children, hospital patients, seniors and shut-ins. La Russa is also a vegetarian. The La Russas have two daughters, Bianca & Devon, and reside in Alamo, California. La Russa is also personal friends with celebrities outside the sports world, such as pianist and songwriter Bruce Hornsby, Bruce Springsteen, and jazz bassist Christian McBride. In 2007, at a concert in San Francisco on La Russa's birthday, Hornsby played a comedic song he named "Hooray For Tony". The original song, titled "Hooray For Tom", is La Russa's favorite Hornsby song. In the "Hooray For Tony" version, Hornsby mentions the "Bash Brothers" Mark McGwire and José Canseco (from La Russa's days as the manager of the Oakland A's), Albert Pujols, Jim Edmonds, ARF, and La Russa's World Series Championships. La Russa is a graduate of the University of South Florida and the Florida State University College of Law. La Russa has Italian and Spanish ancestry, and speaks fluent Spanish. His father's parents were migrants from the Italian island of Sicily and his mother's family originated from Spain. Having a father who could speak Spanish and Italian and a mother who could speak Spanish, La Russa claimed in a 2008 interview that “Spanish was my first language.” He was inducted into the National Italian American Sports Hall of Fame in 1998. La Russa was also inducted into the Hispanic Heritage Baseball Museum Hall of Fame on April 11, 2008 in a pregame ceremony at AT&T Park. La Russa and Pujols attended Glenn Beck's "Restoring Honor" rally on August 28, 2010 in Washington, D.C. while the Cardinals were in town for a series against the Washington Nationals. LaRussa decided to attend after being told by Beck that the rally was not political in nature. 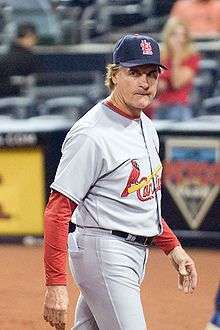 Throughout the 2011 season, La Russa has been struggling with shingles. He originally disclosed that it was conjunctivitis, however, on May 10, after a visit to the Mayo Clinic (Scottsdale, Arizona), he disclosed that he was dealing with a case of shingles, and had to take off a few days for treatment and rest. Because bench coach Joe Pettini was named 'acting manager' instead of 'interim manager', it assures that La Russa will be credited for all wins and losses the team plays without him there. ↑ Goold, Derrick; Hummel, Rick (December 9, 2013). "La Russa, Torre, Cox unanimously elected to Hall". St. Louis Post-Dispatch. ↑ "Tony La Russa Statistics". Baseball Reference. Retrieved April 28, 2007. ↑ Palazzolo, Joe (October 17, 2011). "TLR: A Manager's Manager, And A Lawyer Too". The Wall Street Journal Law Blog. Retrieved November 3, 2011. ↑ "Member Search". The Florida Bar. Retrieved November 7, 2011. ↑ Verducci, Tom (October 25, 2011). "How to mismanage: La Russa gives a clinic in Cards' Game 5 disaster". Sports Illustrated. Retrieved April 17, 2012. ↑ "The Man in the Dugout". Computer Gaming World. April 1993. p. 10. Retrieved 6 July 2014. 1 2 3 "Tony La Russa". Baseball Reference. Sports Reference. Retrieved December 23, 2014. ↑ "2004 St. Louis Cardinals batting, pitching & fielding statistics". Baseball-Reference.com. Retrieved November 4, 2013. ↑ "2004 League Division Series – St. Louis Cardinals over Los Angeles Dodgers". Baseball-Reference.com. Retrieved November 4, 2013. ↑ Leach, Matthew (October 21, 2004). "Cards earn trip to World Series". www.stlouis.cardinals.mlb.com. Retrieved November 4, 2013. ↑ Dodd, Mike (October 27, 2004). "Finally! Red sox win World Series". USA Today. Retrieved November 4, 2013. ↑ Sheinin, Dave (October 29, 2006). "La Russa Gets Number He Wants". Washington Post. ↑ Leach, Matthew (October 28, 2006). "Cards secure 10th World Series title". St. Louis Cardinals. MLB. Retrieved February 21, 2011. ↑ "Tony La Russa, All-Star manager for NL, misses baseball relationships but not dugout". huffingtonpost.com. July 9, 2012. Retrieved July 10, 2012. ↑ Gilbert, Steve (May 17, 2014). "D-backs name La Russa chief baseball officer: Overseeing baseball operations, newly created position will report to team president". MLB.com. Retrieved May 17, 2014. ↑ "Arizona hires La Russa to run baseball operations". ESPN.com. Associated Press. May 17, 2014. Retrieved May 17, 2014. 1 2 Jaffe, Jay (May 18, 2014). "Diamondbacks hire Tony La Russa as new chief baseball officer". Sports Illustrated. Retrieved May 21, 2014. ↑ Hernández, Dylan (December 4, 2015). "Zack Greinke signs six-year, $206.5-million deal with Arizona Diamondbacks". Los Angeles Times. Retrieved December 5, 2015. ↑ "Cards' La Russa set to pass McGraw: Skipper to move to No. 2 all-time in games managed". MLB.com. September 30, 2009. ↑ "La Russa just third to notch 2,500 wins: St. Louis skipper joins Mack, McGraw with milestone victory". MLB.com. June 21, 2009. Retrieved June 22, 2009. ↑ "Pujols powers sweep of Royals: Sluggers two homers, six RBIs net La Russa's 2,500th win". MLB.com. June 21, 2009. Retrieved June 22, 2009. ↑ Hummel, Rick (November 4, 2013). "La Russa, Torre, Simmons on Hall of Fame ballot". St. Louis Post-Dispatch. Retrieved November 4, 2013. ↑ Cardinals Press Release (January 18, 2014). "Cardinals establish Hall of Fame & detail induction process". St. Louis Cardinals. MLB]. Retrieved January 29, 2014. ↑ "La Russa's last game is a first". St. Louis Post-Dispatch. July 11, 2012. ↑ Greenya, John (April 3, 2005). "A triple play of new books to usher in opening day.". The Washington Post. Retrieved June 20, 2010. ↑ Associated Press (March 30, 1995). "Estranged Daughters Sue La Russa.". The San Francisco Gate. Retrieved October 26, 2011. 1 2 "Tony LaRussa". National Italian American Sports Hall of Fame. Retrieved January 4, 2014. ↑ Pi-Gonzalez, Amaury (October 23, 2006). "St Louis Cardinals win their 10th World Series". Hispanic Heritage Baseball Museum News. 1 2 Pi-Gonzalez, Amaury (Summer 2008). "Tony La Russa Inducted to Our Hall of Fame, Pre-Game induction ceremony at AT&T Park" (PDF). Hispanic Heritage Baseball Museum News. Retrieved December 25, 2008. ↑ "Tony La Russa on Tell the Truth". YouTube. August 20, 2011. Retrieved November 5, 2013. ↑ "Cops: La Russa was asleep at intersection". Retrieved March 22, 2007. ↑ "St. Louis Cardinals' manager Tony LaRussa sues Twitter". Retrieved June 17, 2009. ↑ "three strikes against Tony La Russa's Twitter lawsuit". Retrieved June 17, 2009. ↑ Bluestone, Jillian. "La Russa's Loophole: Trademark Infringement Lawsuits and Social Networks". Villanova University School of Law. Jeffery S. Moorad Sports Law Journal. Retrieved 28 February 2015.